I’ve bagged Lenins by the dozen. And even a couple of Stalins. But a Brezhnev? In the wild? Now there’s a real rarity. But there he was, striding casually down the street in downtown Novorossiysk. So I nabbed him. This isn’t the doddering, geriatric Brezhnev of the 1980s. This is the rising apparatchik, posed with a hint of rebellious informality, a loosened tie and a jacket casually slung over one shoulder. Not the wooden politburo veteran, but the younger man-of-the-people getting ready to grab power. 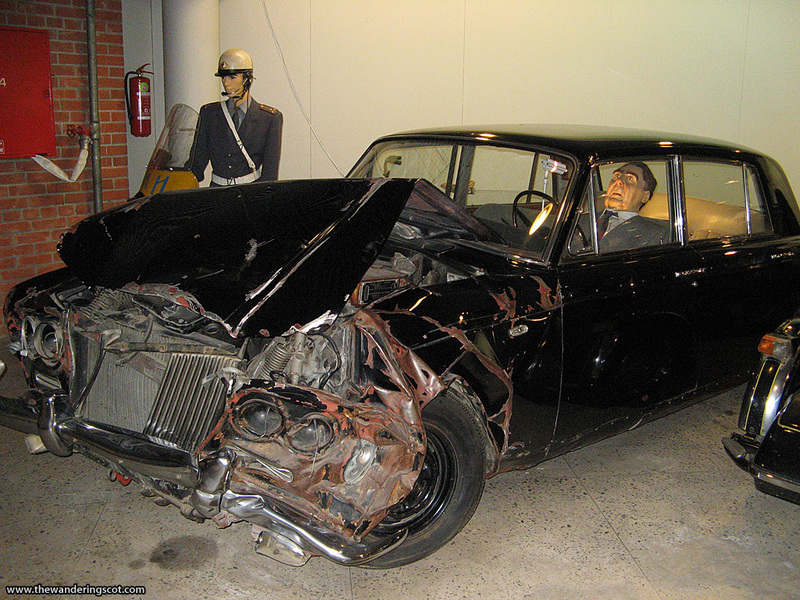 The Brezhnev who recklessly sped in (and sometimes crashed in) high-end foreign cars. 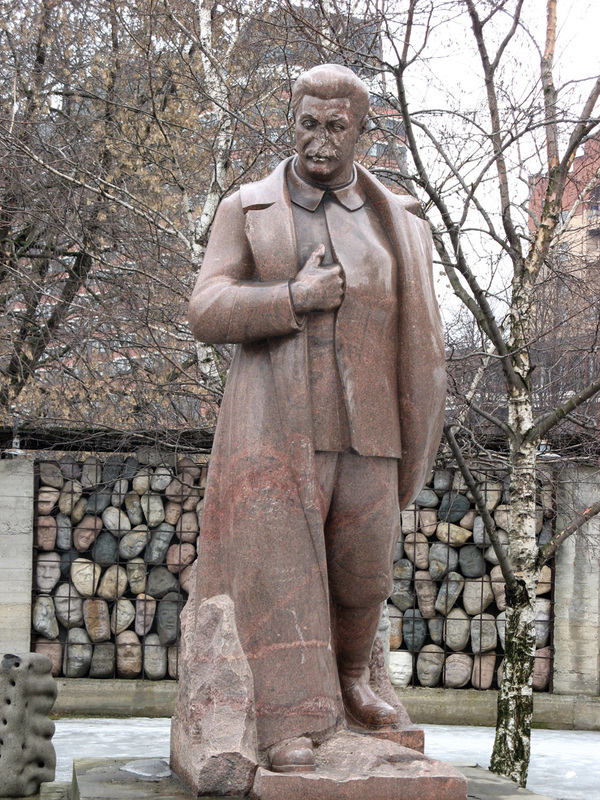 The most amazing thing about the statue is that it was erected in 2004, long after the fall of the USSR, paid for by local public contributions. 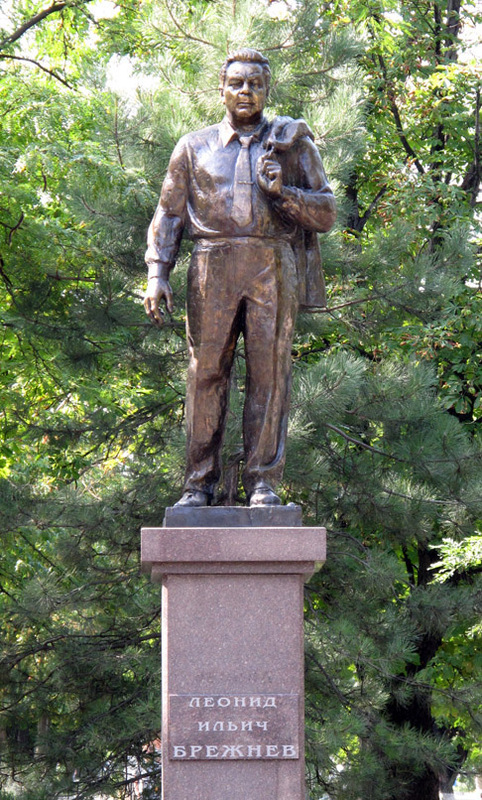 Why does Novorossiysk love Leonid Brezhnev so? Well, Brezhnev liked to emphasize his heroic war record, centered on the Northern Caucasus, including Novorossiysk. As Brezhnev rose in power, so did his remembered heroism and so did the remembered importance of (among others) the heroic battle of Novorossiysk. And so in 1973 Novorossiysk was awarded the prestigious Soviet title of “Hero City”, one of only a dozen such. And the citizens are no doubt grateful for this favor. I took a trolleybus out to the delightful Riga Motor Museum. 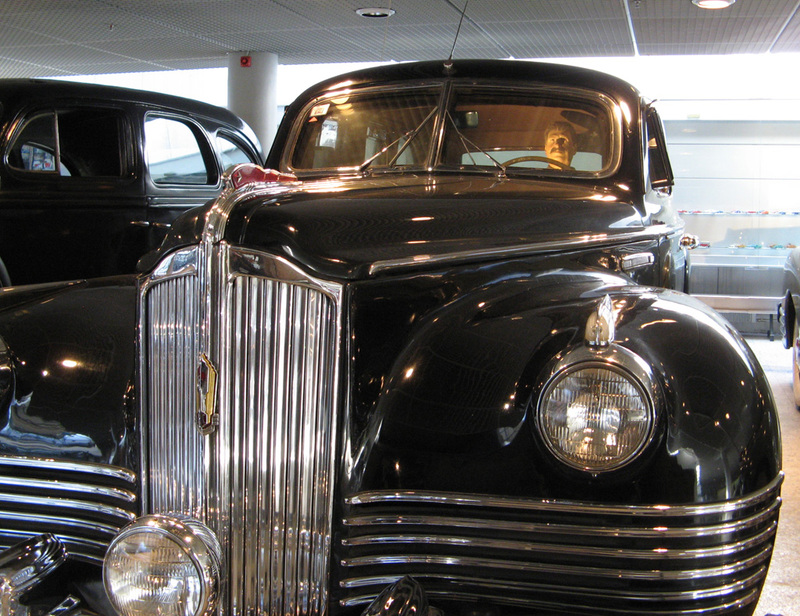 This hosts a fine collection of historic vehicles, but most famous is their exhibit of classic Kremlin cars, acquired back when Latvia was still an SSR. 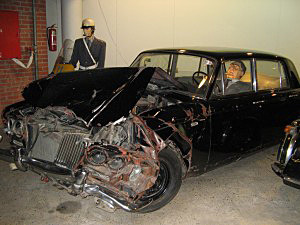 Their finest piece is probably the preserved wreckage of Leonid Brezhnev’s beloved Rolls Royce Silver Shadow. 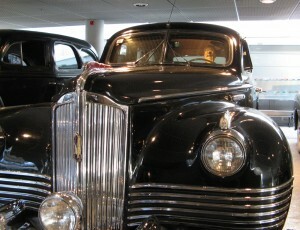 (Apparently there was a sad lack of Rolls Royce repair shops in Soviet Moscow.) 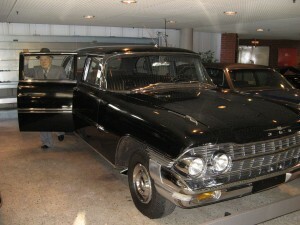 Brezhnev had a passion for high end cars, typically gifts from foreign governments, and for driving them at speed. In 1980 he disastrously pranged the Rolls Royce. 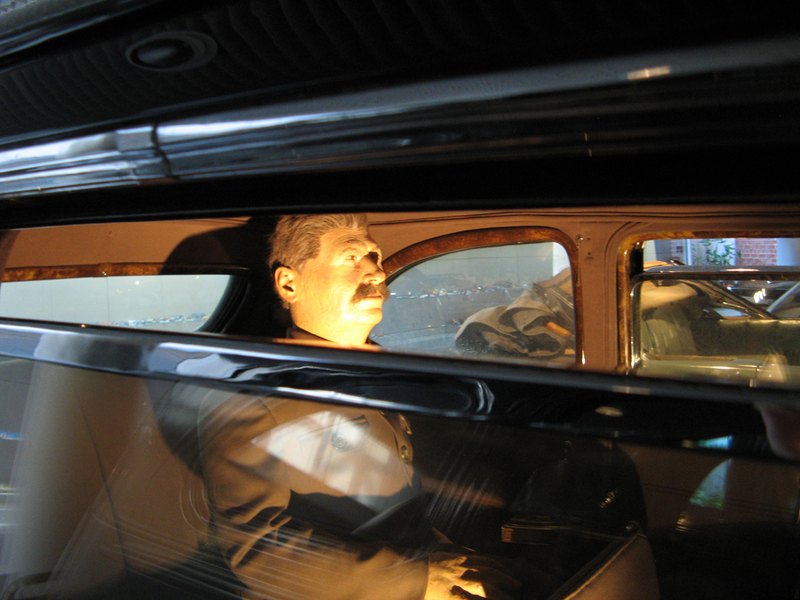 The exhibit has a touching reconstruction, including an authentically equipped Soviet motorcycle cop and an authentically wooden-looking Brezhnev. But my own favourite is Stalin’s pristine 1950 armoured ZiS-115S. Complete with an inscrutable back seat passenger. And isn’t that Andrei Gromyko exiting a ZIL? 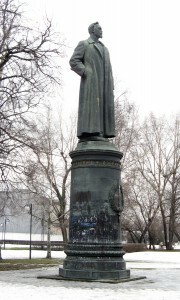 Moscow’s Tretyakov Sculpture Garden (aka the Art Muzeon Sculpture Park) hosts a wide variety of modern sculptures, including a number of abandoned Soviet statues. These statues appear to be consciously presented as debris from a past life – this doesn’t seem like an attempt to glorify the Soviet past, but merely to record it. It is at GPS 55.7361,37.6090 outside the New Tretyakov gallery, just South of the giant Peter the Great statue. 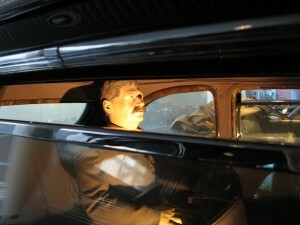 It’s well worth a visit if you care about Moscow’s Soviet past. A striking and dramatic statue of Felix Dzerzhinsky, founder of the Cheka (later the NKVD, then the KGB) on a high plinth with the KGB emblem at the front. This is the very statue that used to stand in front of the KGB headquarters in Lubyanka Square and which was dramatically toppled in August 1991. 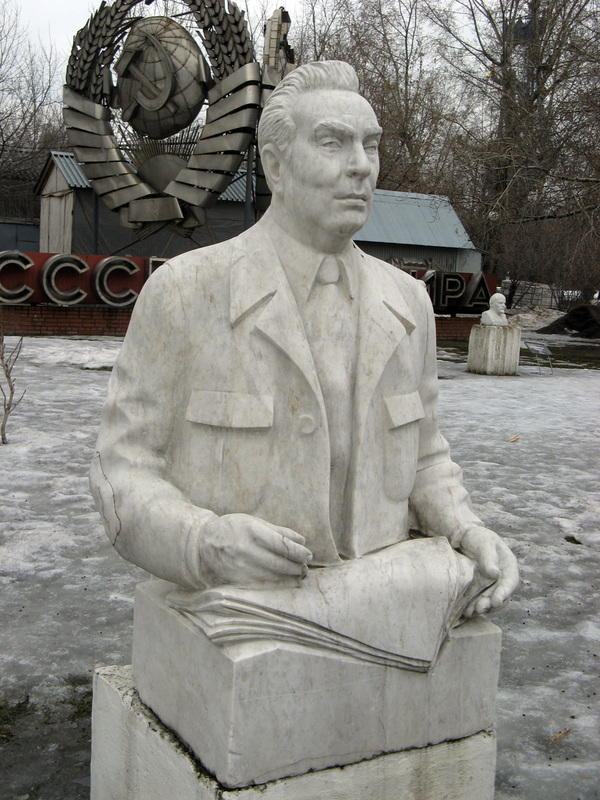 A rare Brezhnev bust, looking characteristically blank. 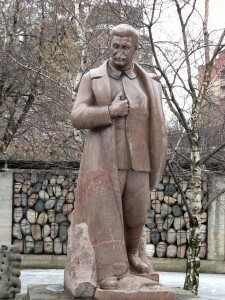 A sad and defaced Stalin statue. 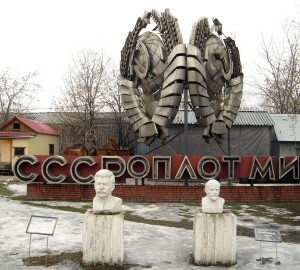 Stalin and Lenin busts, guarding giant Soviet insignia. 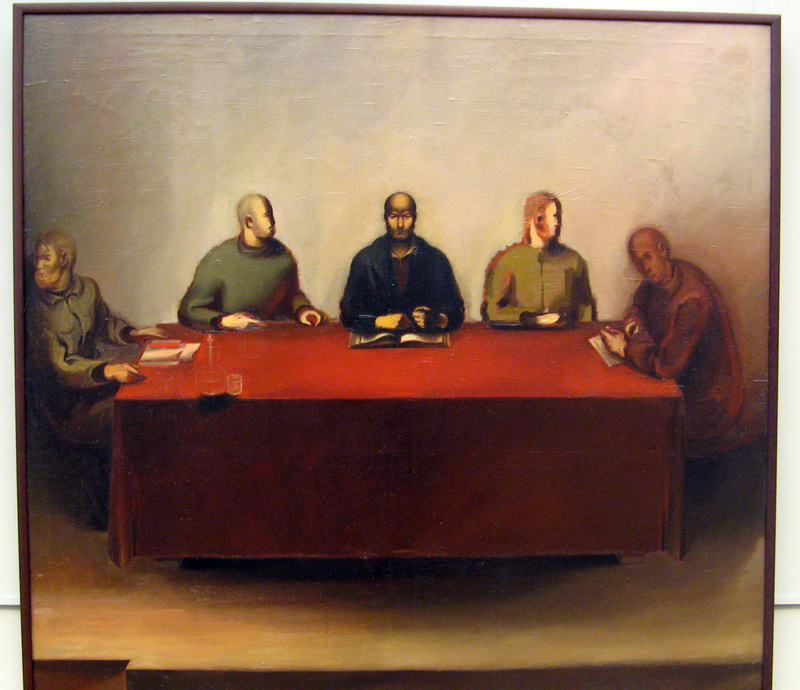 ”Defence of Petrograd”, A. Deineka (1927). 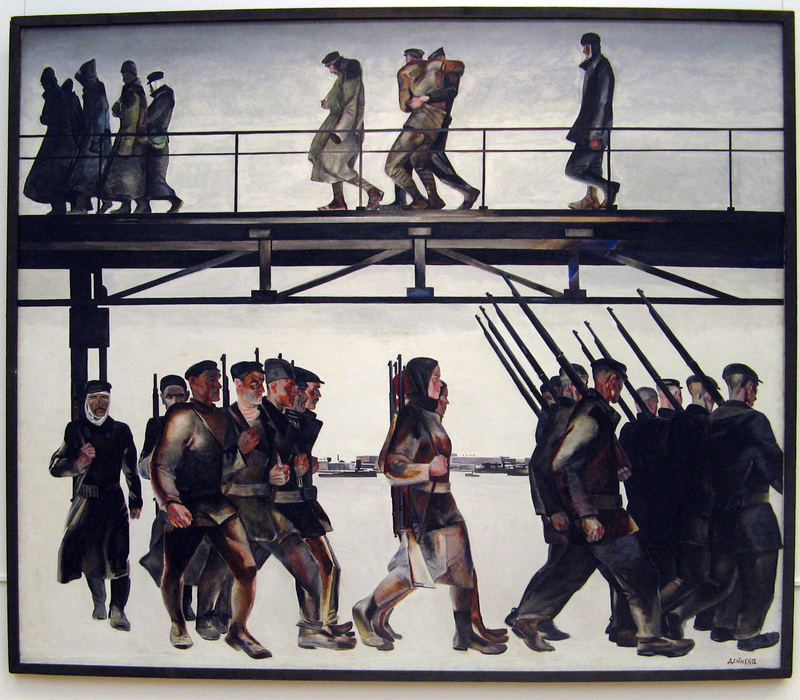 The workers’ militia marches to the front. The injured return. 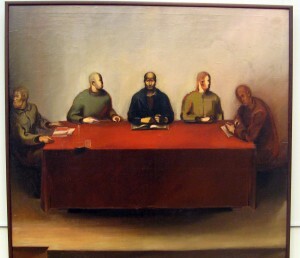 “A People’s Court”, S. B. Nikritin (1934). A grim view of Soviet Power, showing a strange mixture of threat and fear. A very brave painting for 1934.